Beautiful Pics and I'll squeeze my egg tomorrow. Beautiful pictures... they do work wonders now! I love squeezing a (boiled) egg...hehe.. its so soft and gives a weird pleasure.. :)) love the pic! Mandira, good to see you out and about! Keep drinking those warm fluids and get better soon! Siri, I know what you mean! Medha and I are both waiting till after the Science Fair to squeeze that egg till the membrane gives way and the albumen and yolk ooze out! How's it done? The way you mentioned earlier - dissolve the Ca in vinegar? Doesn't look like that though...Tell, no. Ah! I was wondering when someone would ask. But you know what? You already know! Just drop the darned things in regular distilled vinegar. 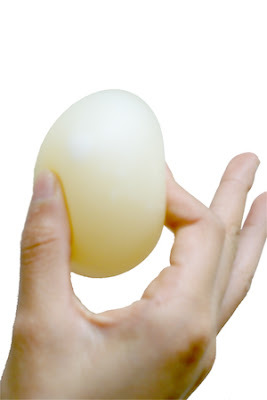 Both need refrigeration and it takes only 2-3 days for the calcium in the egg shell to dissolve. The chicken bone took over a week. Here's a pic of the egg soon after it was dropped into vinegar. Bubbles formed on the shell and soon it started floating. It looked like it was effervescing. Once some of the calcium had dissolved, the egg settled at the bottom of the jar and actually expanded. It's translucent and you can see the chalazae bob about and make out where the yolk is. It's a pretty cool experiment but very easy - we only do easy for the Science Fair! We changed the vinegar every day till the calcium had dissolved completely. Wish bone of a chicken! Total fun! and the picture are brilliant! Suganya, I squished the control egg yesterday. I couldn't bear it anymore! We cannot take the egg for the Science Fair but we are holding on to it just in case we need more pictures. Asha, you're amazing as always! I cracked the wishbone so we couldn't use it. It would have been much quicker than this one! Musy, thanks! But quite honestly, the first one could do with more work - I just selected and deleted the background leaving frayed edges. But it's for a child's Science Fair project, so it's OK! Shantanu, welcome to IFR! As part of an initiative taken by the food blogging community, we have been trying to create an awareness of plagiarism as well as copyrights. Thank you for taking corrective action quickly! yikes!!! and what happens to the yolk? Bee, what you are looking at is a shell-less egg, held together only by its outer membrane. So the yolk stays in, until it is sqooooshed; then, it trickles out.